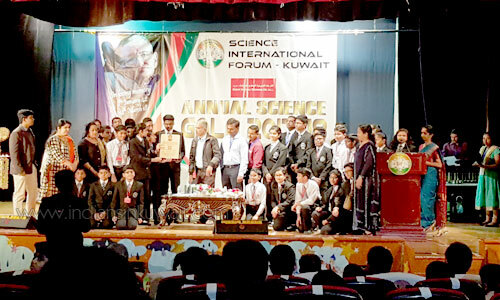 The Annual Science Gala for the year 2017-'18 was held on 6th of April, 2018, by Science International Forum (SIF), Kuwait in association with Kuwait National Exchange Co. at The Cambridge English School, Mangaf. Dr. Raju Narayanaswamy IAS was the chief guest for the evening. A multifaceted man with many awards and accolades to his name made the day cherishable for the budding scientists and other enthusiasts present at the venue. The winners and outstanding performers of Sastra Prathibha Contest 2017-‘18 and Kuwait Children's Science Congress 2017 were honoured at the function amidst exultant approbation. 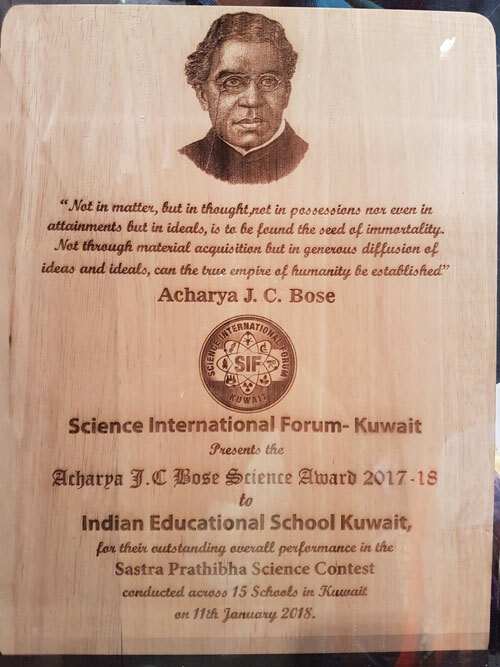 IES – Bhavans, Kuwait was declared the best performing school and received the prestigious Acharya JC Bose award 2017- ‘18 from Dr. Raju Narayanaswamy, IAS for the outstanding overall performance in the Sastra Pratibha science contest conducted across 15 schools in Kuwait on 11th January 2018 by SIF for three consecutive years. 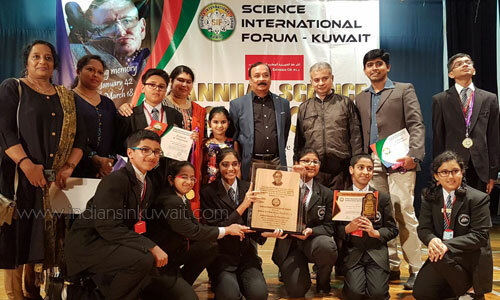 Sastra Pratibha 2018, Kuwait winners are: Nevin Noji Vaidyan of grade 6 and Vishnu Balram of grade 8. 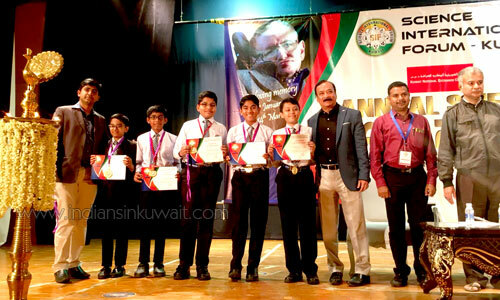 Sastra Pratibha 2018, Kuwait Outstanding Performers are: Yunus Hamdan, Harshit Choudhary Polarapu of grade 5, Aldrin Joseph Sebastian, Adarsh Harish, Suparna Sunil, Ashwin Sajan Pillai, Pavithra Rajeev, Mahathi.C.A, Hannah Rael Zachariah of grade 6, Srihari Badrinarayanan, Lakshmi Sahiti Vallabhaneni, Krishna Chillirickal Anil, Joel Dan Shibu, Shivya Hari Chella, Pranav Chandrasekar, Nityaansh Parekh, Noel Frederic of grade 7 Sachin Sreekumar, Yash Somvanshi, Joshua Alex George of grade 8, Gayathri Rajeev, Karthik Sudheer, Chrissa Merin Oommen, Tanmay Sahu, Sharon Balaji Raveendran, Sandra Santhosh Krishna, Shreya Varsha Arun and Abhishek Jayant Patil of grade 9. 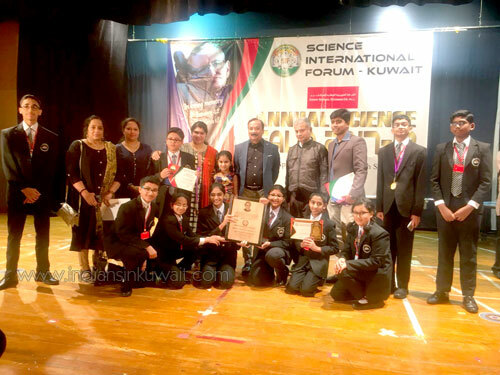 SIF felicitated the students of IES who excelled in the Kuwait Children’s Science Congress – 2017, Junior Category A grade winners are: Shreya Varsha Arun, Sunny Alex, Mohammed Mujtaba Ali, Marushka Fernandes, Tanmay Sahu guided by Mr. Sudhi.A.K and Mrs.Deepasree.T, Haran Amrith Krishnakumar, Ethan Boby Kurian, Dave Rino, Jonathan Peter Nelson, Ejo John Varghese guided by Dr. S. Jeya Ganesh. Mr. T. Premkumar, the principal IES exalted the remarkable tour de force of the young budding scientists of Bhavans and appreciated the relentless support of the Department of Science, of which he is a guiding star, in effectuating yet another feat of glory and bringing that in to the home of excellence the third year in succession. Sad to look at the news as it is incomplete and just praising Bhavans. Further the Bhavans school principal who was asked to speak about the event also congratulated only his school children failing to understand that there were children from different schools who are being honoured. Look ahead at IIK to publish the complete news as from 14 only 2 Sastra Pratibha winners name are highlighted. Congratulations Bhavans School. My kids used to be here until they left for India. The amount of encouragement the staff led by their principal is the source of energy for the kids to perform at the highest level of contests. Read all the school reports and you can see the energy of the principal in each one of them and I remember when my daughter won a prize at one of the company functions she made it a point that we kept it in her bag as the following day the principal made an announcement over the public adddress system in the school and everyone clapped for her. Sheer proud moment and that is why IES is a special school and not for other reasons. This is not the report written by the SIF officials for you to react. The reports that you will read in this section are written by the school reporters and they are not going to write a comprehensive report for you to see all the 200 odd winners that were felicitated that night. Bhavans will write only about their children and their principal's message to the kids. You should ask your kid/s school to write their accomplishments and not hold IIK for this report. Let us congratulate the kids whose names appear and the winners of the trophy and then we can write our suggestions to SIF and not IIK. First of all congratulations to SIF Kuwait for conducting the events and for all the prize winners. The report does not show all the winners. The whole report looks incomplete without mentioning the names of all the winners and outstanding performers from other schools too. Just highlighting one school which received JC Bose award is not acceptable.